Professionally grown chrysanthemum in custom printed, team licensed pots. These colorful expressions of team pride come with a keepsake team helmet tag. Great for home decorating, tailgating & great as gifts. 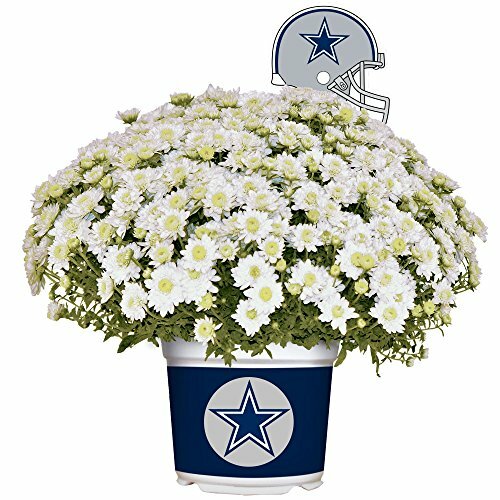 Beautiful Fall garden mum in your favorite team's colors. Fresh Team Color Mums bloom for weeks. Water daily and keep in a sunny location. Blooms in Fall, perfect for football season. Fun decoration for Homegating or Tailgating! Ships anywhere in the Continental USA. Makes a great gift for a long distance fan or for a college student's dorm. Fall Team Color Mums ship in September and October. Orders Ship within 24-48 hours of receiving. We do not ship over the weekend to avoid spoilage. Each Team Color Mum is shipped with one or more open flowers, and many more buds. Please unpack your order immediately for best plant quality. If you have any questions about this product by Sporticulture, contact us by completing and submitting the form below. If you are looking for a specif part number, please include it with your message.